Used for treating diabetes, diarrhoea, fever, hepatitis and cardiovascular dysfunction. Recognised antioxidant and diuretic effects. Our dietary supplement Annatto Tocotrienols is formulated from an extract of Bixa orellana. Also known as roucou, urucum and achiote, this shrub grows in tropical regions of the Americas, where its spiky red fruits are recognised for their health benefits. Known as annattos, these seed-filled fruits have been used for many years in traditional medicine, where they are recommended for treating insect bites or for protecting against the sun’s rays. In actual fact, Bixa Orellana fruits offer considerably more benefits. They are rich in carotenoids such as beta-carotene, a powerful natural antioxidant, and contain a number of trace elements including selenium, magnesium and calcium. They also have a high content of a specific form of vitamin E called tocotrienols. Formulated from the fruit of Bixa Orellana, our dietary supplement thus offers a natural vitamin E concentrate. prevent cardiovascular events such as heart attacks and stroke, by protecting low density lipoproteins (LDLs) – particles known for their key role in transporting cholesterol in the bloodstream. Given its essential role in the body vitamin E must be ingested from the diet in sufficient amounts. While it is present in plant-source foods such as vegetable oils and nuts, intake can nonetheless fall short of optimum levels. In fact, there is not just one form of vitamin E but eight distinct forms, which are grouped into tocopherols and tocotrienols. There are fewer dietary sources of tocotrienols which is why our supplement Annatto Tocotrienols has been formulated from natural tocotrienols extracted from the fruit of Bixa orellana. This formulation offers 90% delta-tocotrienols and 10% gamma-tocotrienols. help prevent or reduce the development of several diseases and ailments such as atherosclerosis, diabetes, hepatitis, diarrhoea, fever and cardiovascular dysfunction. Our nutritional supplement Annatto Tocotrienols has been developed to both reduce the risk of vitamin E deficiency and capitalise on the benefits of this molecule. It offers significant therapeutic potential for preventing and treating certain diseases. 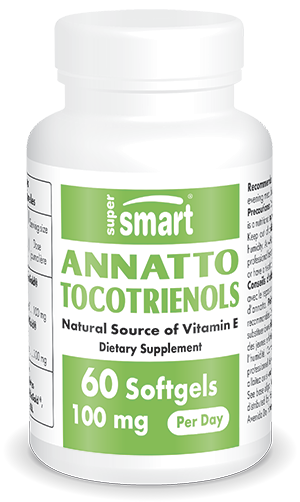 In order to create a high quality supplement, Annatto Tocotrienols has been formulated from natural extracts and is produced in the form of softgels. Each capsule contains 100mg of annatto extract (Bixa Orellana) standardised to 50% tocotrienols. This formula means the recommended dose is 2 capsules a day, to be taken with dinner. In addition to these natural tocotrienols, you can also find other forms of vitamin E in our product Gamma E Tocopherols. Each softgel contains 50 mg annatto tocotrienols.